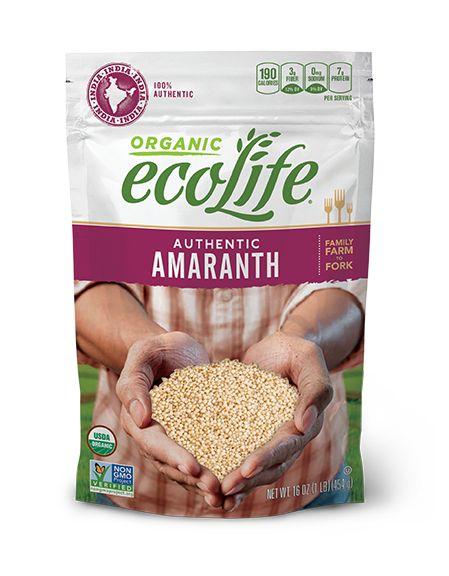 ecoLife® Authentic Amaranth is grown in India, where EcoLife’s registered organic farming families harvest vibrant red, gold and purple flowers and collect the amaranth seeds inside. These powerful little seeds boast an impressive nutritional profile: they’re high in protein and fiber, an excellent source of minerals like calcium and iron, and even contain every essential amino acid. 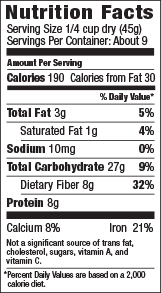 Naturally gluten-free, Amaranth is an excellent alternative to traditional wheat products and its delightfully chewy texture and nutty taste blends perfectly into soups, porridges, polentas, and baked goods. Combine 1 cup amaranth and 2 ½ to 3 cups water in a saucepan. Bring to a boil. REDUCE HEAT (medium-low to medium) and cover. Simmer 20-25 minutes or until water is absorbed. For a more porridge-like consistency, use 3 cups water and cook for 25 minutes.